Harboring priceless mountain views and hints of American pride throughout, Olde Glory is more than a mere place to stay — it’s a home away from home. With updated furnishings and an overall cozy feel, this 1-bedroom, 2-bathroom cabin in Pigeon Forge – completely remodeled for 2018 – will surely impress. It boasts all new furniture throughout, including new sleeper sofas, recliners, beds, patio furniture, and more. Plus, the remodeled kitchen is just the place to whip up in-cabin meals! Host an action-movie night in the media room, take a luxurious bubble bath in the indoor jetted tub, whip up a homecooked meal in the fully equipped kitchen, and enjoy evening soaks in the hot tub while watching your favorite drama on the outdoor TV! It’s a comfortable, beautiful cabin with Smoky Mountain views and the comforts of home! While you may be tempted to take a long nap after your travels on the comfy leather living room sleeper sofa or in the recliners, feel no shame as you flip to your favorite channel on the mounted big screen TV. Cuddle up with your love under the American flag blanket and grab a few throw pillows for extra comfort, because movie night is just around the corner. Lay out a smorgasbord of sweet and salty snacks for the whole family on the large coffee table and put your drinks on the 2 end tables for safekeeping. For extra wiggle room, let the kids sprawl out on the large area rug — perfect for pre-movie tickles, mid-movie wrestles, and post-movie snuggles. After everyone’s hit the hay, relax in one of the 2 recliners, keep toasty by the charming fireplace (electric), and let a good book sweep you away for a while! If others are still awake from the thrills of the day, bust out your lucky deck of cards for a game of Spades or Rummy. Better yet, head to the side area for a rousing round of pool! Should the gaming fun get too exciting, simply turn on the ceiling fans to cool things down. Generously stocked with pots and pans, dishware, silverware, cookware, and more, the kitchen is fully equipped for bountiful breakfasts, tasty lunches, and delectable dinners. Store drinks and produce in the refrigerator, simmer soup on the stove, pop popcorn in the microwave, brown bagels in the toaster, brew happiness in the coffeemaker, and wash dishes in the double sink. Even better, let the dishwasher take care of the dirty work for you! Thanks to the home’s open floor plan, the chef of the family can enjoy both mountain views from the large windows and TV shows from the living room’s flatscreen TV — all while creating mouthwatering meals. If cooking feels more like a chore than a delight, simply order pizza, place it on the granite countertops, and chow down at the breakfast bar! Take in the breathtaking Smoky Mountain views while you dine on homecooked meals and scrumptious restaurant leftovers at the dining table. After the meal is over, clear the table for arts and crafts or coloring time with the kids. In the morning, stay warm and cozy in the dining area while soaking in the sunrise with a freshly brewed cup of coffee. Head downstairs to the media room for afternoon chats on the sofa and evening films on the flatscreen TV. Gaze at the mountain views from the large windows as you and your bestie unwind on the 2 recliners — that’s right, this cabin has 4 recliners total, making relaxation inevitable! Bring along a few board games to play on the large coffee table or take advantage of the natural light to start sketching your next mountain-inspired masterpiece. After a day well spent in Pigeon Forge, get some much-needed rest on the king-size bed in the master suite downstairs. If you’re too pumped to sleep, chill in bed with your favorite sci-fi series on the flatscreen TV. With an indoor jetted tub in the en-suite bathroom, spa nights just got even better! Bring on the soothing bath bombs, rose-scented lotions, exfoliating foot scrubs, and moisturizing face masks. In the morning, get ready with the large vanity and mirror and grab your fully charged devices from the 2 nightstands to take on your morning hike in the Great Smoky Mountains National Park. After parking in the motorcycle-friendly driveway, grab your luggage and walk up only 3 steps to officially start your cabin getaway! Just off the living room, you’ll find a prime mountain-viewing spot on the top deck, great for taking selfies and family pics. Relaxation begins here. 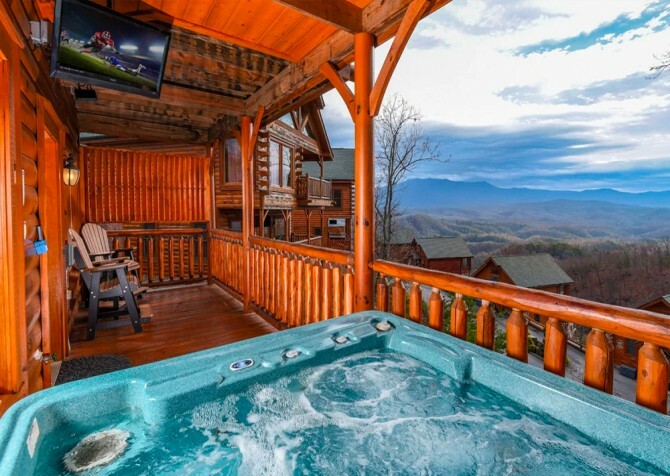 Venture to the lower-level deck off the media room for nightly soaks in the outdoor hot tub — complete with epic mountain views and an outdoor TV! Watch a classic drama or comedy while unwinding in the rejuvenating water. As you sit at your balcony-height chairs with a small table for your morning coffee or nighttime glass of wine, soak up those awesome mountain views and enjoy the peacefulness of the Smokies. By providing a convenient washer and dryer, this home makes it easy to leave plenty of souvenir room in your suitcases. With the ability to launder clothes whenever the need arises, packing light is now an option! Another key amenity is the cabin’s high-speed internet, which allows for faster status updates, video uploads, and picture posts! As if Olde Glory didn't offer enough amenities, Legacy Mountain Resort boasts even more community perks! Spend days splashing around in the outdoor pool with stunning mountain views and plenty of room to spread out and soak up the sun. The gorgeous pavilion, open year-round, boasts a flatscreen TV, picnic seating, and a beautiful stone fireplace. And the clubhouse has a great workout facility with unbelievable mountain views! Located in the Legacy Mountain Resort in the scenic Smoky Mountains, Olde Glory is just up the mountain from some of the most exciting attractions in the South. Dollywood is not far from the cabin, Dollywood’s Splash Country is the place for summertime fun, and Anakeesta is an all-new attraction with ziplines, shopping, dining, a playground, a nature walk, and more! From lovely landscaped gardens to exquisite parrot cottages, Parrot Mountain and Gardens is a magical place for all ages to enjoy. When you visit, keep an eye out for the little yellow door that leads to the secret garden! Ride exciting rollercoasters, learn about bald eagles, explore the playground with your little ones, consume customized funnel cakes, and see amazing shows at Dollywood. Experience a grand adventure in the Smokies by ziplining through the trees, traversing a rope jungle, tackling trails via ATV, and climbing a 60-foot rock wall at the Foxfire Mountain Adventure Park!